… so I kept going. Last night after posting the pattern for the scalloped fingerless gloves I went ahead and posted the instructions for different non-double-stitch chains. It’s a free pattern and it’s easily downloadable from my Craftsy store. 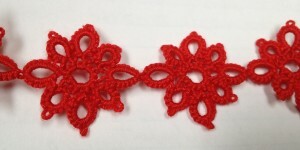 The handout also includes instructions on making quick and easy bookmarks with chains of these stitches. They’re a great way to finish off the last couple feet of thread on your shuttle. Now live on Etsy and Craftsy! I had an order today for my Variations on a Theme booklet about the magical transforming motif and all the different things you can do with it. The customer also ordered the pattern for the large gloves variation, no realizing it was already included in the booklet. I offered to either refund her money for the glove pattern or send her the pattern for these scalloped gloves (which is what she chose). 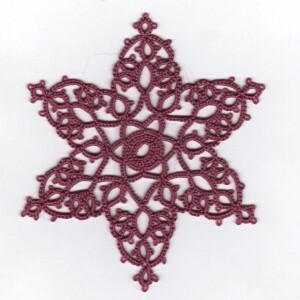 It’s also occurred to me that I should put my handout on non-double-stitch chains up on Craftsy as a free download. I usually send it along with my other patterns on Etsy, but Craftsy is an automatic download for the user, which is VERY nice for me, but means they don’t get the handout. At some point I will also list the pattern for the coin purse which I also basically have done, but want to run though again before listing. The tricky bit with the coin purse is that it’s designed around a specific size and brand of purse clasps. It’s the smaller sized of the Everything Mary brand. I’ve found it at Joann’s and had no problem finding it in Southern CA, but so far have only found one Joann’s store in the Seattle area that carries it and of course now I can’t remember which one it was. I’m thinking about doing 3 listings for the coin purse. One with just the pattern, one with the pattern and a clasp for those who can’t find them locally, and one that’s just the clasp for people who want to make more than one. What do you think? Does that seem like a reasonable solution? I have just finished my proposal for my five Shuttlebirds classes and sent it in for approval. This is definitely the earliest I’ve ever gotten it in. I like the new set-up with the application form. Even though it was more to fill out than we’ve had in the past, having it broken down into smaller chucks got me to go through it a lot faster. And it helped that I’ve been collecting class ideas over the last year and still have about 13 on the list for next year. So strange to think that two years ago I was struggling to come up with a 5th class idea. Since I already mentioned 3 of the 5 in my last post I’ll tell you about the other two here. The first is a class on working with size 3 thread. Lizbeth is coming out with their size 3 thread mid-November and I am so excited about this it’s ridiculous. I’m not sure if my boyfriend is amused by how excited I am or a little worried. I’ve done a number of projects with size 3 thread and really like it, but there’s just been no high quality thread in that size. The best I’ve been able to find on a regular basis was Royal (even that wasn’t very good) and when they stopped making it a year or so ago I decided to hold off on buying any replacement until I could find a good quality one. Just a few months later Lizbeth made their announcement and I’ve been impatiently waiting for the fall. Size 3 in the colors and quality of Lizbeth. How can anyone not be excited? Mid-November! Just a month away! 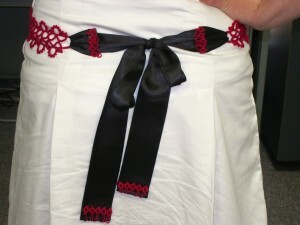 The class will be focused around making a decorative tatted belt and attaching it to a ribbon that will tie in the back. 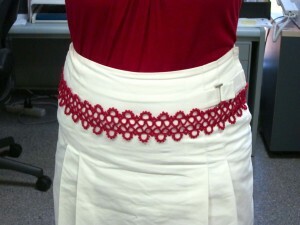 We won’t finish the belt in class, but we’ll get it started and get one of the two ribbons sewn on to the tatting. In the process we’ll go over tips and techniques for working with really big thread. I haven’t made any new belts for a while so I’ll have to take a look at what I’ve got. Of course there were all made with Royal thread and so have been starting to pill and get fuzzy so I suppose I’ll have tat up a couple of new, nicer looking ones before April. Guess I just don’t have any choice but to stock up on the new thread next month when it comes out. Got to be ready for Shuttlebirds! The last class is on the Catherine Wheel Join. Tess Moffatt taught this class at Wannatat in Spring and that’s how I finally got the hang of them. 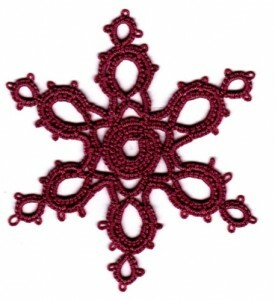 She had two snowflake motif patterns to choose from and passed out printouts of Jane Eborall’s instructions on the join. I always love Jane’s instructions and the diagrams she makes. Everything is always so clear. Tess and Jane have graciously given me permission to use their patterns and instruction sheets in the Shuttlebirds class so I have sneakily gotten my prep for one class finished already while simultaneously giving my students much better materials than I would ever come up with myself. Actually, that’s not quite true about the prep since I still need to make a couple of samples for the class. With all my other classes it’s usually the other way around. The samples are already made and I just have to figure out how to write up the instructions. Still lots to do, but I’m excited to be moving along with the classes! Hope to see many of you there! The last couple weeks have been very busy! I took the first of my CPA exams last week and so was very focused on nothing but that until then. As soon as it was done I took the next couple days off from studying (next one is coming up!) and did a bit of catching up with life. And of course, life includes lots of tatting. I’m teaching beginning tatting at the Pacific Fabrics store in Northgate this month, Tuesday evenings October 16th and 23rd (one class two sessions) and I needed to put together some samples for the classes so I heading over there after the test and sat in the store to demo while I made them. Got some interest in the class and hopefully it will be a full one. Here’s the link if anyone is interested. This will be a very basics class. Next month will get a little deeper into working a pattern and then in January I’ll be teaching 3-D flower hairclips as a more advanced beginner class. I’m considering the samples that I worked up last week to be my weekly finishing of an UFO for the week, so I’m staying pretty well on the path of finishing one project every week for the rest of the year. This week I’ve been playing around with a new veil pattern and I think I’ll do another one with the same edging as I used for the first one. It worked well because there were no joins in the pattern and so it formed nicely around the veil, letting the veil give shape to the tatting rather than the other way around. The new pattern I’m working on has a natural curve, but it doesn’t match the circle of tulle. I don’t think it will matter once it’s pulled together into a veil. In fact, the extra ruffle will probably be nice. I have another one that has a much thicker and straight edging and I’m not sure how that’s going to turn out. Hopefully well since I really like the colors and the pattern. The big thing I’ve been working on this week is getting together my application for Shuttlebirds. I’ve got all 5 class proposals written up and just need to put together my teacher bio and some of the pictures. I may get that done today, but if not, then by the end of the weekend for sure. I am proposing the veils as a class so I’ll be working on a lot more of those over the next couple months. The pictures on this post are for two of the other classes I’m proposing. Both are adaptations of a pattern from Priscilla Tatting Book #3. In one class we’ll look at using modern techniques to make it an easier pattern to make (split rings!) and in another we’ll take it a few steps further and add two more shuttles and encapsulation to have the flowers alternate colors. I can’t wait for April!